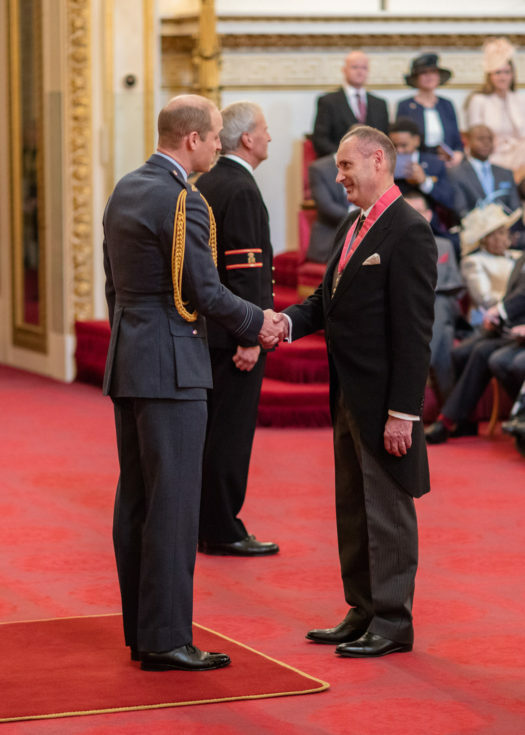 Nick Coburn, Ulster Carpets Group Managing Director and Deputy Chairman received the award of Commander of the Order of the British Empire (CBE) at an investiture ceremony performed by the Duke of Cambridge in Buckingham Palace on 28th March 2019. He was recognised by Her Majesty the Queen in the New Year Honours List for his service to the economy in Northern Ireland. Building on Ulster’s success in the UK market Nick founded its US Company in 1993 and went on to build its international contract business in key locations across the world. Known for designing beautiful and luxurious carpets worldwide, the company prides itself that all its carpets are still woven and exported from their County Armagh factory site, Castleisland. You can find some of their most creative designs gracing the floors of the InterContinental Paris Le Grand, Grosvenor House London, the Waldorf Astoria New York and W Hotel Muscat to name but a few and aboard many cruise liners including the majestic RMS Queen Mary 2. Ulster Carpets was started by Nick’s grandfather George Walter Wilson for the main purpose of bringing employment to Portadown. It has stayed within the Wilson family since first opening its factory doors in 1938. With over 80 years’ experience in weaving carpets, generations of skilled local craftsmen and women have helped to grow the company to where it is today. Recently completed was the new state of the art company Dyehouse and Energy Centre, this is the first stage of the company’s 40 million capital investment and regeneration programme. With 75% of the product being exported out of the UK, Ulster Carpets has proven that it is possible to successfully sell to every continent in the world despite many barriers and challenges. For the future, under the guidance of Nick Coburn CBE and his dedicated team, Ulster Carpets will continue to uphold its reputation for focusing on design, innovation and the pursuit of excellence.